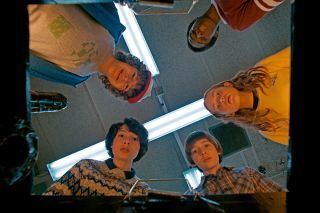 Clockwise from the top are Lucas, Max (a new character), Will, Mike, and Dustin. The second season of Netflix's hit show "Stranger Things" is set to debut Friday (Oct. 27). But devoted fans don't need to wait till the end of the week to discover clues about what will happen when the show returns. Last season, viewers learned about the nefarious plans behind the fictional electrical company Hawkins Power and Light as the main characters delved deeper into the show's strange parallel universe, the "Upside Down." Now, billboards advertising the corporation have appeared in Los Angeles and New York, sporting the slogan "Flipping the Switch for a Brighter Tomorrow," and the number 1-888-355-8703, as reported by Bonnie Burton at CNET. The number connects to an actual phone line, where a recording from Dr. Sam Owens, the company's new director of operations, greets callers. The automated system sounds ordinary at first, but drops strange clues as callers explore the menu options. Trying to report an outage or suspicious activity leads callers to the most revealing clue. "We're sorry. Our reporting service is full," the message says, according to CNET. "You may notice a slight decline in vegetation. We can assure that this is a standard effect of the new and improved grid that's powering the Hawkins' dream. We're actively working to remedy the situation, and we apologize for any inconvenience." But don't worry, checking the company's hours of operation will bring up a reminder of the 24-hour service line, which is available to report any disturbances such as "flickering lights, auditory irregularity or erratic electronic behavior."